London: James Carpenter, 1820. 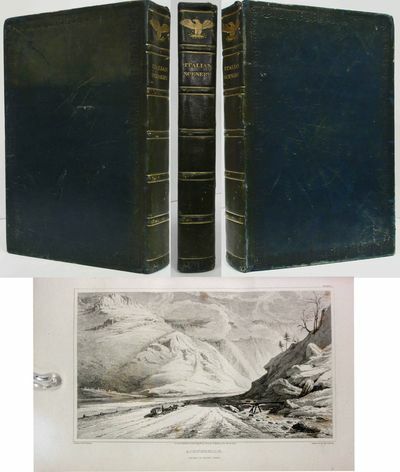 Two volumes complete - Volume One - xlvi, , 50-175pp,  and Volume Two - 148pp. Contemporary full morocco, semi-raised bands, spines in six panels, title in gilt to second panel, volume number to fifth, remaining panels gilt with flower corner pieces and central fleur de lis, covers with thick and thin fillet bordering an anthemion roll frame with a central arabesque, gilt roll to edges, gilt flower roll to inner edges, watered silk doublures, a.e.g. with attractive fore-edge paintings to each volume; volume one showing four cherubs frolicking in an urn and volume two showing an old man under a blanket talking to a cherub who is holding a cup. Slightly rubbed to extremities, small ink spot to upper cover of volume one and lower cover of volume two. One or two spots of foxing, some off setting from frontispiece on to title, frontispiece probably lacking tissue guard, but generally bright and clean. Each volume with Selborne library stamp to foot of reverse of title and once to bottom margin of text leaf, volume one with small book label of Marion C. Walker to reverse of silk endpaper, small amount of glue remnant where a previous owners' book plate has been removed. Pencilled note to endpaper stating the book was from James Toovey's library (possibly the glue remnant mentioned above, it could well have been an oval bookplate like Toovey's); another pencilled note in the same hand notes that the binding is by Edwards of Halifax, though there is no direct evidence of this. The fore-edges appear to be initialled but I cannot make the initials out. The fore-edges look, to me, like they have some age, but Weber notes that most fore-edge paintings are twentieth century in origin. Reprint. Full Morocco. Very Good. 12mo. Fore-edge Painting. Neu-Market, Va.: Salomen Henkel, 1820. Woodcut frontispiece and titlepage vignette. 12mo. Original cloth backed, paper covered boards, decorated with woodcuts of an elephant and a rooster. Boards very lightly stained. Internally bright and clean. A near fine copy, in original condition. 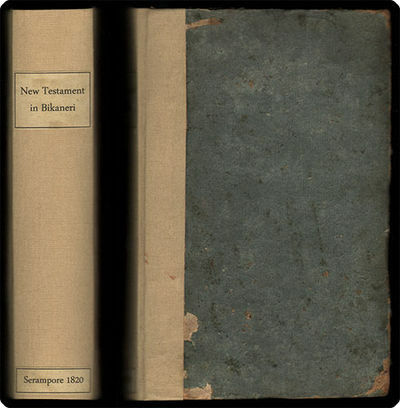 Styled "Second edition" on the titlepage, though with a pagination conforming to the first edition. A charming speller and alphabet book for children, produced by the Henkel family press in New Market, Virginia in 1806. Led by the renowned preacher, Paul Henkel, they established the first Lutheran publishing house in the United States. The Henkels published numerous Christian catechisms, hymn books, and other works. The present title is a wonderful example of their pedagogical efforts, designed to teach children to read and spell in German, thereby perpetuating German culture and language in the United States. SWEM 8228. SHAW & SHOEMAKER 1569. Serampore [India]: Printed at the Mission Press 8vo (20.5 cm; 8.125"). 649 pp.. 1820 First and apparently sole printing of any portion of the Bible in Bikaneri (a.k.a.Vikanera), a Marwari language of the Rajasthan region of India. The text is in Devangari characters with an added title-page in English that reports the text was "translated from the originals into the Vikanera language by the Serampore missionaries." The title-page also makes clear that this was meant to be vol. V of a complete translation of the Bible, but that project was never completed and it seems no other books of the Bible have been translated into the language. The non-English title-page reads, in transliteration: "Svaraki sagali katha, jake adamyamkem uddharavei aura calanavei codem karyochem, u, Dharma pustaka, unko chedalo virada, va mhakem taranavala Bhagavanna Yisukhrishtaka phayadaki, Mangalika vatam." => The paper used for the text seems to be native-made laid stock. WorldCat and NUC combine to locate only six copies in U.S. libraries, one of which is this one, properly deaccessioned. Provenance: Ex–Colgate Rochester Crozer Divinity School library; properly deaccessioned. Contemporary boards covered with blue paper a bit scuffed, soiled, and with areas of wear; original paper shelfback replaced with cloth of a closely matching color. A very little library pencilling; no stamps. Edinburgh: Archibald Constable and Co, 1820. Copyright date is 1820, 1st edition, 1st printing.Scott, Sir Walter. Ivanhoe. Edinburgh: for Archibald Constable and Co, 1820. 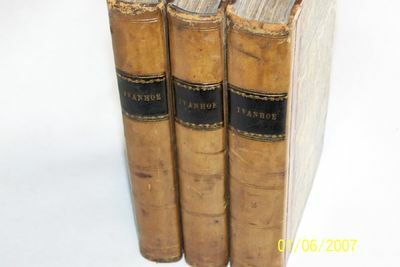 3 volumes. With half-titles, first volume wanting leaf 79/80, second volume lacking one preliminary leaf, third volume lacking leaf 15/16. Period half-calf over marbled boards, rebacked, with light wear to extremities. Early ownership inscription to half-title leaves (dated 1821), some detached leaves, generally clean though with some minor stains and light foxing in places, a few short closed tears. 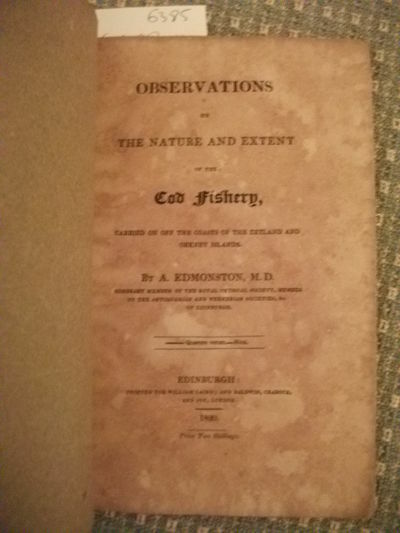 First edition, first issue of this classic work. . 1st Edition. hard Covers. Good/no dust Jacket. 7Â¾" - 9Â¾" Tall. Collectible. ANON - FORUM OF NERVA. Original ink drawing of Forum Transitorium from c. 1820. - Unsigned. 47,8x30 (57,5x42) cm. In newer goldframe. XXXIV (34) Kupfer zur Altdeutschen Baukunst. London. : T. Cadell and W. Davies., 1820. Hardcover. Very Good/Not applicable. 8vo - over 7Â¾ - 9Â¾" tall. 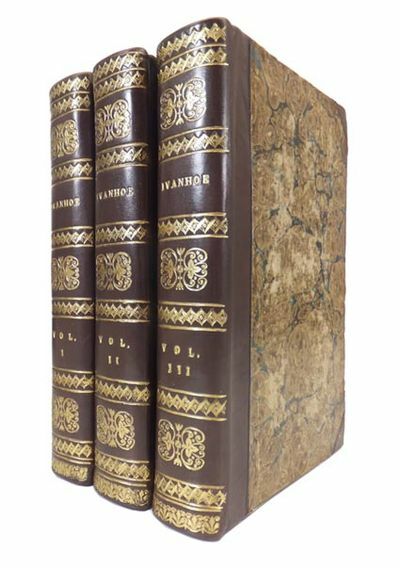 Thomas Stothard.. 1st edition with Stothard copper engraved plates. Volume 1 has 92 pages of preface and life of the author also FULL bibliography of his works & vignette title page + 429 pages. Volume 2 has 415 pages and vignette title page as called for, 20 copper engraved plates + 2 vignette titles. Complete & Collated. Original 1820 cloth boards as sold, original printed paper labels on spine. Uncut edges to paper, wide margins and all on hand made paper. Condition. Some intermittent foxing, quite mild to just noticeable, mainly to several plate edges rather than pages, etc. Some foxing but light and infrequent. Last page of volume one has central crease due to careless closing and one plate torn without loss, (would repair) at page 213 of volume 1, no loss clean single tear. Cloth very good with a split started at head of volume 1 and corners a little worn. NICE period association Inscription to both volumes of "Laura Isabella Hoare. The Gift of her Affec't Sister, Mary A Prince (nee Hoare) 19th April 1839". **Both these ladies were part of the original Quaker bankers, the Gurney Barclay Hoare families, who became the global banking company Barclays, who were not without the stink of corruption in banking at the end. Tall octavo (23 x 14.5 cm or 9.2 x 6 inches). TWO Volumes. VG. 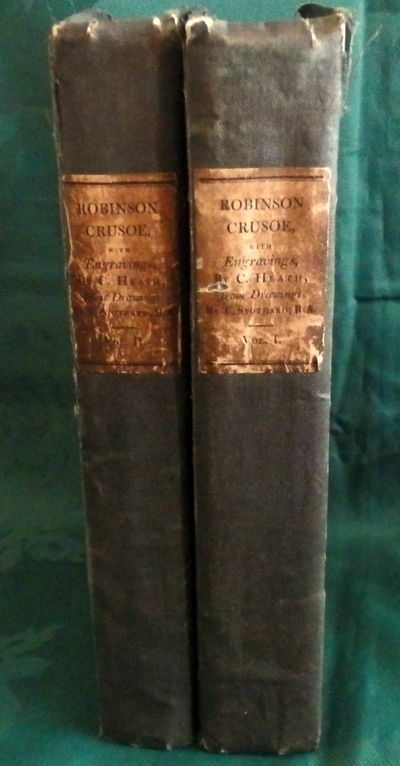 1820 *This is the adult version of the tale with Crusoe escaping the Island, settling in the Americas, involving himself killing natives in heated revenge with other English & Spanish sailors and eventually travelling to China and other Asian destinations. London: R. Ackermann, 1820. xxviii, 115pp, ; 24 plates. Handsomely rebound by Temple Bookbinders in full morocco, raised flat bands, spine in six panels, title and author labels to second and fourth panels, remaining panels gilt, covers with double panel design, inner panel with black onlay, elaborate gilt borders, gilt to inner edges with marbled endpapers. Internally some light soiling and offsetting, some plates with faint offsetting from text but generally clean, folding plates a little creased at outer edge, plates with stab-holes to outer margins. Twenty-four colour aquatint plates by T.Sutherland, G. Maile and J. Bluck after Vidal, (four folding). 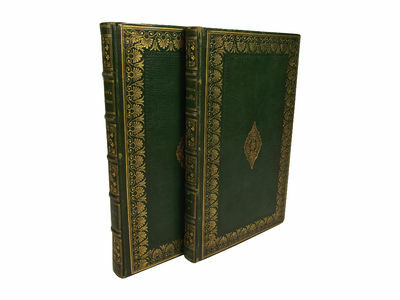 Housed in a modern morocco-backed cloth drop-back box with raised bands, spine in six panels, title in gilt to second panel, author to third, date to foot, with silver flower device to fourth and fifth panels. "English interest in South America flourished after the capture of Buenos Aires by Commodore Sir Home Popham and Colonel Beresford in 1806 ... Ackermann exploited the widespread and substantial interest in South American affairs that these events had aroused, through a number of fine publications including these views" (Thomson - The Exotic and the Beautiful).Tooley 495, the "only notable colour plate book dealing with the Argentine"; Abbey Travel 698; Thomson 31; Colas 3000; Brunet V:1182/83. First Edition. Hardback. Very Good. Folio. Zeichenschule in Umriß und Ausführung. Zwei Hefte zu je 12 Blatt. Gezeichnet, lithogr. U. gedrkt v.L. Ekeman Alleson. - Kreidelithographien mit mittlerer Trennlinie um 1820. C. 25:35,5 cm. Nicht bei Winkler.- Heft 1: Rasenstücke, Häuser, Felsen, Geröll, Baumstümpfe, ast- und Blattwerk, Bäume. Heft 2: Perspektive, Bäume, Bauernkaten, Ruinen, Uferböschung, Aquädukt. Als Direktor der 1821 neu errichteten lithographischen Schule in Stuttgart wurde der aus Schwden gebürtige Lithograph und Maler lorenz Ekeman-Allesson berufen. Er war 1806 mit seiner Mutter auf ein Rittergut bei Jena gezogen, wo er als Landwirt ausgebildet werden sollte. Doch nach Ende der napoleonischen Kriege wandte er sich dem Kunststudium in Augsburg, München und Wien zu. Seine Zeichenschulen mit Naturstudien waren beliebte Anleitungen zum Zeichenunterricht an den Kunstschulen und Akademien. London: Rodwell & Martin. Very Good. 1820. First Edition. Hardcover. Blue lightly scuffed leather with a bit of color fading and light edge ware. Blind stamped with a border. Raised bands with gilt decorated panels. 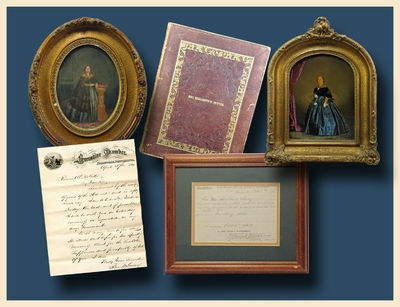 Sixty full page tissue protected engravings and three vignettes. (8) ,197 and (3). Deckle page edges. Prior owners book-plate. 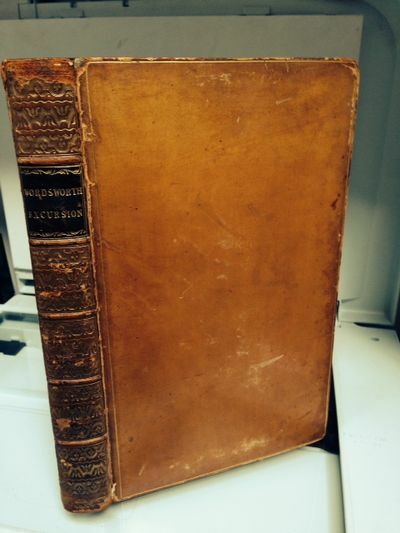 English Text; Engravings; 4to 11" - 13" tall; 197 pages . Fatherless Rosa or, The Dangers of The Female Life. London William Emans [Thomas Kelly] 1820. 8vo. 522pp. + 1pp plates list and 1pp. ads to rear (including an ad for Huish's "Castle of Niolo" published in 1820 and "The Castle of Inchvally" by Stephen Cullen presumably an Emans reprinting of the 1796 work). Original endpapers (including an admonition against borrowing label to the front pastedown), internally clean and sharp. A very superior copy. The frontispiece portrait of Huish is present, as is the general engraved title page bearing the Kelly imprint (issued with the first installment of the 22 parts) followed by the Emans title page. It's likely that seeing as the two publisher's shared the production responsibilities for the work they issued two title pages at some point before the final installment was issued in 1821. The BL copy only has the Emans title page (as far as I can recall), and the Huish portrait is frequently missing. Regardless any imprint is scarce. 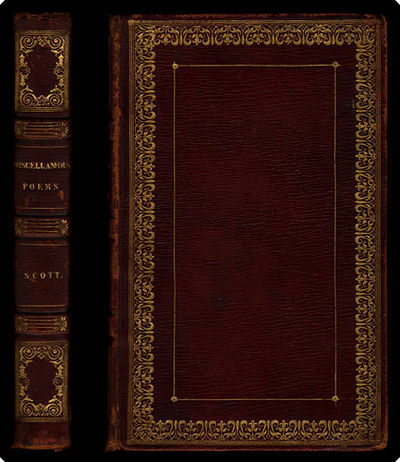 Montague Summers himself only possessed the 1834 edition. A really splendid piece of Gothery. Gales and Seaton. Hardcover. Washington, 1820. 12mo, [iv], 409 pp. Contemporary paper covered boards. Expanded to include 23 states, including Alabama and North Carolina. 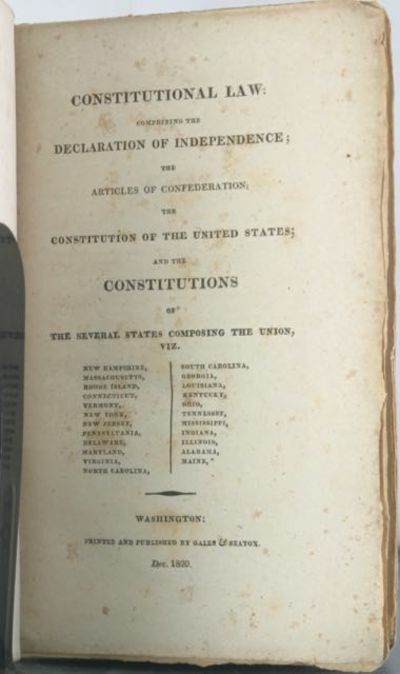 The first edition, published a year earlier, included just 21 states. A good copy with fraying and chipping to paper at spine, foxing to contents and contemporary ownership marks to endpapers. Contents complete. Please contact us for additional pictures or information. Seven copies in OCLC. Cohen, Bibliography of Early American Law 3014 . Good. 1820. Second Edition. Oeuvres complètes de Voltaire. 70 Bände (so vollständig)! [Text Französisch]. Vollständiges Taschenbuch für Kunst- und Lustfeuerwerker und Liebhaber dieser Unterhaltung, zur Erhöhung und Verschönerung ländlicher Vergnügungen, besonders bey Volks- und Familienfesten. Nach den neuesten und besten Hülfsmitteln bearbeitet. Geographie und Statistik Wirtembergs, der Geographie erste.zweite.dritte Abtheilung. Woldemar. Erster und zweiter Teil in 2 Bänden (komplett). Treuttel et Würtz 1820 - 1822. Ensemble six volumes in - 16 (143 x 92 mm), veau noisette, dos à cinq nerfs orné, décor central à froid sur les plats, filet noir, dentelle à froid et dentelle or en encadrement, dentelle sur les coupes et intérieure, tranches dorées (reliure signée Vogel). Orné de 10 eaux - fortes par Duplessis - Bertaux, et 6 gravures d'après Moreau. Bel exemplaire (malgré de petits défauts d'usage, frottements sur deux charnières et quelques coiffes, rousseurs). // Set of six 16o volumes (143 x 92 mm), chestnut calf, spine tooled raised on five bands, central blind tooling on covers, black fillet, blind and gilt dentelle borders, dentelle on turns - in and inside, edges gilt (binding signed Vogel). Illustrated with 10 etchings by Duplessis - Bertaux, and 6 engravings after Moreau. Nice copy (despite litlle defects of use, rubbings on two hinges and some top and bottom of spine, brownings). Detroit: Sheldon & Reed, 1820. 20th-century cloth, gilt leather labels. Library ink stamp on titlepage. Light foxing and soiling to text, some minor wear. Very good. 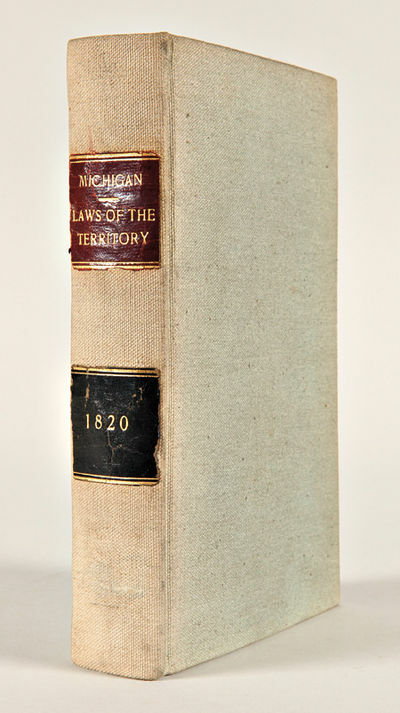 Early laws for Michigan Territory, including a reprinting of the ordinance creating Northwest Territory. Michigan Territory, established in 1805, included the present states of Wisconsin, Minnesota, and Iowa as well as part of the Dakotas. Michigan gained statehood in 1837, at which point the remaining land area fell under the title of Wisconsin Territory. Scarce and early for the region. SHOEMAKER 2253. AII (MICHIGAN) 46. SABIN 48747. Die Alterthümer der heidnischen Zeit Schlesiens. (Band I - alles !). New Orleans, 1820. Modern paper boards, paper labels. Moderate foxing and browning. Very good. An expanded variation of this interesting Louisiana legal item, after its first appearance in 1818. "Las Siete Partidas" translates as "The Seven Parts," referring to the number of principal divisions. This work is a compilation of the customary laws of Spain, the civil law, and the canon law, collected by four Spanish legal consults under Alphonso X in 1250 and promulgated as law in 1348 by Alphonso XI. 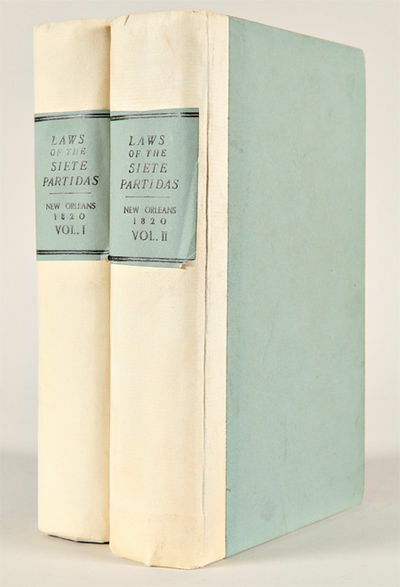 At the time of publication, the laws were still in force in Louisiana, Texas, and Florida, especially those sections relating to water law. Sabin quotes Ticknor's SPANISH LITERATURE in calling this "A curious and learned work." COHEN 3645 (ref). SABIN 42244. SHAW & SHOEMAKER 2019. Johann Andreas Naumann's. Naturgeschichte der Vögel Deutschlands, nach eigenen Erfahrungen entworfen. herausgegeben von dessen Sohne Johann Friedrich Naumann. Edinburgh: Archibald Constable & Co., and Hurst, Robinson, & Co. (pr. by James Ballantyne) 8vo (22.2 cm, 8.75"). viii, 510,  pp. (pagination skips 66-85).. 1820 Beautiful edition of gathered verses by Sir Walter Scott, containing "The Bridal of Triermain," "Harold the Dauntless," "William and Helen," and what the advertisement calls "all the Smaller Pieces, collected for the first time in the recent edition of the Author's Poems" — decorated with a fore-edge painting. The Fore-edge: Simple but charming design of six bright butterflies in red, orange, yellow and blue. Provenance: Front pastedown with armorial bookplate of John Train. 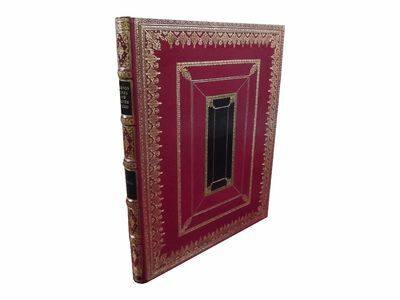 Binding: Contemporary maroon straight-grain morocco framed in wide gilt border and panelled in gilt single fillet, spine with gilt-stamped title and decorations, board edges (at corners) and turn-ins with gilt roll. All edges gilt. Binding as above, moderately rubbed; hinges (inside) slightly tender. Front free endpaper verso with inked ownership inscription. Light to moderate foxing throughout, pages otherwise clean. - altkol. Umrißkupferstich v. F.A. Schmidt n. Radl b. Wilmans, um 1820, 37,5 x 52,5 Seltene Ansicht. Untere Ecke links mit restaurierter Fehlstelle.Im Himmel kleinere Abschabungen retouchiert. - Mit Wasserzeichen "Turkey Mills. J. Whatmann". Portrait König Friedrich Wilhelm III. Pastell. MEISSEN. "Ansicht von Meissen unterhalb der Brücke am rechten Ufer". Blick über die Elbe auf die Albrechtsburg, im Vordergrund Frauen beim Wäsche waschen. - Aquatinta in Sepia von C. Rordorf nach Arrigoni bei G. Weiss & Comp., Dresden, um 1820, 17,5 x 26 cm. Nagler, Rordorf Nr. 1. - Malerische, hübsch staffagierte Ansicht über die Elbe. Schönes, sauberes Exemplar. Nuovi pensieri su la pubblica istruzione considerata nei suoi rapporti con la liberta' e col governo di Giorgio Masdea. Edinburgh: William Laing, 1820. 38pp. Heavily foxed on title page and rear endpaper.Covers worn and chipped at spine. Very scarce. . Assumed First Edition. Paper covers. Good+. Wilhelmine Reichard, erste deutsche Luftschifferin, bey ihrer 15ten Luftfahrt im Prater zu Wien 1820. Rheinuferansicht mit St. Martini ('Village Sur Le Bord D'un Canal'). Gesamtans, vom rechten Rheinufer aus, "Cöln. Cologne". London: John Fairburn, 1820. First Edition. 1 vols. 8vo. Contemporary boards, black stained edges, rebacked and with new corners, some internal foxing, else a nice, crisp copy. First Edition. 1 vols. 8vo. "The Bible of the Reformers". 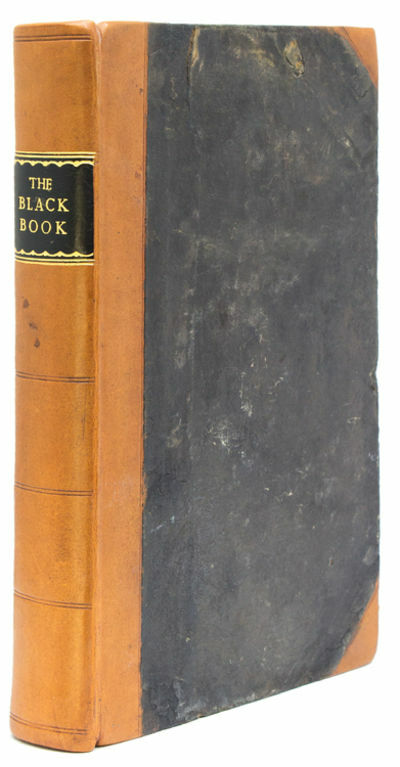 The first edition of a book which led the battle for electoral reform in 19th Century England, being a compilation of the financial, political, ecclesiastical, and nepotistic abuses which were sustained under the institution of rotten and pocket boroughs, and which brought about the passage of the Reform bill of 1832. The Bill redistributed 143 parliamentary seats to industrial areas, providing more proportional representation, reducing the traditional powers of the large landowners and the aristocracy, and strengthening the British system of parliamentary democracy. 193 kolorierte Kupferstiche von Fr. Stöber aus der "Wiener Zeitschrift für Kunst, Literatur, Theater und Mode". Wien ca. 1820-30. Lose. - 193 kolorierte Kupferstiche von Fr. Stöber aus der "Wiener Zeitschrift für Kunst, Literatur, Theater und Mode". Wien ca. 1820-30. Lose. Thieme/Becker XXXII, 83 und 228. 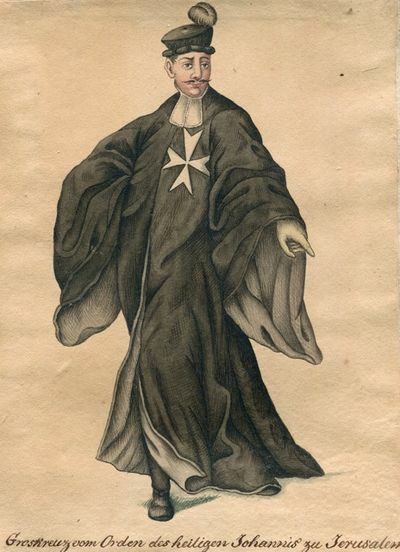 - Eigenständige Wiener Damen- und Herrenmoden-Entwürfe, die damals ohne weiteres mit den Pariser Moden konkurrieren konnten, von Franz Xaver Stöber (1795-1858) nach Zeichnungen Philipp von Stubenrauchs (1784-1848) gestochen. - Leicht gebräunt. Washington City, 1820. 16mo. Contemporary three-quarter roan and marbled boards. Extremities worn, front board nearly detached but cords sound, one signature starting, foxing, some minor dampstaining. A sound copy. The fourth edition listed in Sabin, after the first edition of 1801. This copy is signed in pencil on the titlepage: "L[aFayette] S[abine] Foster's Washington Jany. 15 1831." Foster was a member of the Connecticut State Assembly for many years, and a member of the U.S. Senate from 1855 to 1867. After the death of President Lincoln, he became president pro-tem, and was presiding officer from April 5, 1865 to March 2, 1867. As a conservative republican, he was against repealing the Fugitive Slave Act, the Missouri Compromise, and the Lecompton constitution for Kansas. From 1878 to 1879 he served as a commissioner from Connecticut to settle the Connecticut-New York boundary dispute and buy Fisher's Island. 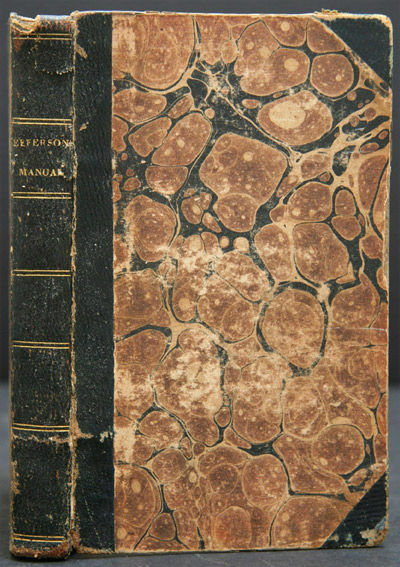 Jefferson's MANUAL... was published shortly after he took office as President. The Virginia polymath sets forth rules of order and procedure - probably more dictating to the legislature than would be tolerated these days. SABIN 35887. AMERICAN IMPRINTS 1789. Edinburgh: Archibald Constable and Co., 1820., 1820. First Edition, First Issue, with page 159 misnumbered, then pagination compromised until end of volume I. Three vols, octavo. Bound without half-titles or terminal ads although preliminary advert leaf bound in volume 1, and all three fly-titles present. Original marbled boards respined and recornered in brown calf to style, all edge marbled. Rather bold armorial bookplates of Admiral and Mrs Robert Lay Page, with both signatures to titles. Internally clean but for a little spotting to first and final leaves, some rubbing to boards. A very good, presentable copy of this classic Medieval adventure set during the Crusades, in which the legendary Robin Hood makes an appearance, initially under the name of Locksley. The character that Scott gave to Robin Hood and his band of 'merry men' helped shape the modern notion of this figure as a cheery noble outlaw. WIEN. - Laxenburg. "Laxenburg bei Wien in bildlicher Darstellung". Sammlung von 16 Blatt. - 16 Lithographien von Jakob Alt, Joh. Rupp, C. Bschor und Alb. von Radmannsdorf, 1820 - 1826, von ca. 28 x 38 bis 40 x 51 cm. Nebehay-Wagner 359. - Die Folge (im Ganzen 55 Blatt) ist als Privatdruck auf Befehl Kaiser Franz I. in sehr kleiner, nicht für den Handel bestimmten Auflage erschienen. Die Tafeln, die neben Ansichten auch Interieurs zeigen, sind nicht numeriert und haben keine Titelbezeichnung. Vorhanden sind: Das alte Lustschloß, Carolinenhain, Gotische Brücke, Lusthaus im Eichenhain, 3 Tafeln mit dem Ritterschloß (von der Ostseite, vom Überfahrtsplatz, mit Knappenhof), Westseite des inneren Hofraums, ferner Rüstkammer, Waffensaal, Prunksaal, Kapelle und Burgverließ. - Wenige Tafeln mit geringem Lichtrand, einige mit leichten Stockfleckchen im breiten Rand. Im Ganzen wohlerhalten. Biographie nouvelle des contemporains, ou dictionnaire historique et raisonné de tous les hommes qui, depuis la Révolution Française, ont acquis la célébrité par leurs actions, leurs écrits, leurs erreurs ou leurs crimes, soit en France, soit dans les pays étrangers. London: Longman, Hurst, Rees, Orme, and Brown,. Very Good-. 1820. Second. Hardback. Brown leather boards; a little scuffed and marked; corners slightly bumped; backstrip detached on left-hand side - binding exposed, but intact; boards attached, and intact. Gilt borders + gilt decoration on spine still bright; gilt titling on dk red panel at head. pp lightly spotted, but supple. ; 8vo (5 1/2" x 9"); 452 pages . Um 1820. - Mit Bleistift eigenhändig bezeichnet "von Tivoli aus". Auf festerem Velin. Das Blatt deutet den Blick in die weite Landschaft an und entstand vermutlich im Zeitraum zwischen den Jahren 1818-23, in denen sich Olivier gemeinsam mit Julius Schnorr von Carolsfeld in Italien aufhielt. - Eins von zwei gleichartigen Blättern, die von Dr. Wilken von Alten als Olivier bestimmt wurden und von denen sich das andere im Besitz der Bremer Kunsthalle befindet (rückseitig alt entsprechend bezeichnet), unten mit einem kleinen Ausstellungszettel "Friedrich Olivier" mit handschriftlichem Zusatz "Orig. Aust. Zettel Nr. 58 der Bremer Kunsthalle". Provenienz: Sammlungen Woldemar Kunis, Sachsen (Lugt 1921), Sammlung Arnold Blome (mehrfach verso, klein recto nicht bei Lugt). - Minimale Fleckchen im Randbereich. Obere Ecken mit Resten einer alten Montierung. Sprache: Deutsch Gewicht in Gramm: 2100 3,8 x 21,5 cm. Papier: 17,6 x 21,5 cm.